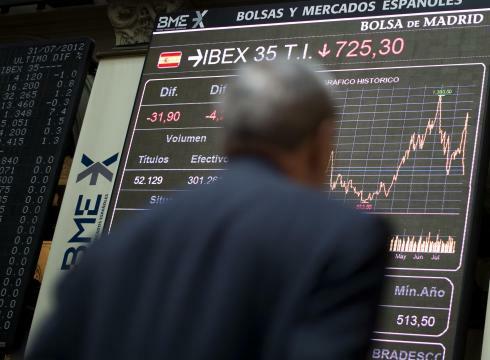 Spain’s struggle to recover after the debt crisis remains as the main stock market saw trading volumes suffer in May. Trading volumes on the Spanish Stock Exchange, across all asset classes, were down over 10% month on month except for ETFs. On the other end, MTFs are seeing gradual uptake of their trading venue as they continue to penetrate the southern European market. Volumes in equities saw a decline of 16.5% for the month of May from April as notional value reached €48.12 billion. A similar trend seen over a 12 month period where trading in stocks was down 14.4% from the previous year totalling €267.93 for the end of May (2013). Derivatives trading on the exchange also suffered as the total contracts for the year hit 3.4 million, down 37% from the same period a year earlier. The exchange saw the highest number of contracts traded in equity options which stood at 2.03 million, again down by 14.3% from the same month in 2012. With the exchange witnessing an era of doom and gloom, competitor’s at BATS Chi-X Europe have something to smile about. The post MiFID trading venue is picking up volume as investors look to cut transaction costs. In the months of March & April the average daily notional value traded on BATS Chi-X Europe in Spain’s IBEX 35 increased to €247.5 million a massive jump from €63.1 million that was traded in January. “BATS Chi-X Europe’s continued momentum in the Spanish market further strengthens our position in one of Europe’s key markets, but our growth in Europe extends well beyond market share,” said Joe Ratterman, chief executive of BATS Global Markets in a statement. 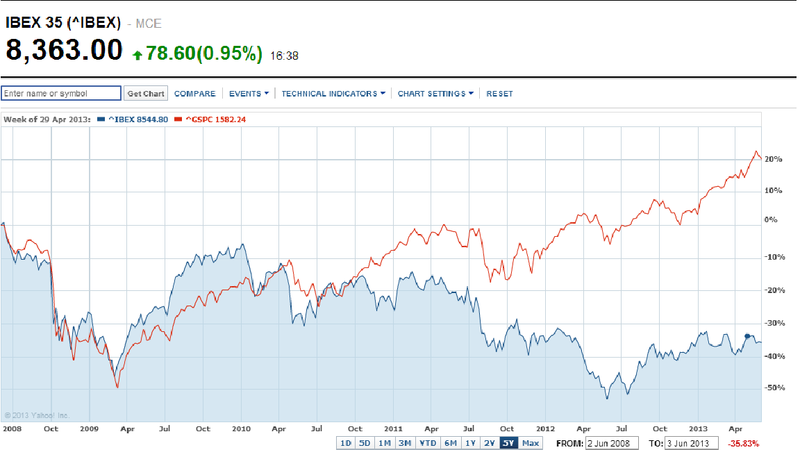 IBEX compared to S&P – source Yahoo Finance. The MTF has been increasing its market share in the recession hit country which has been directly linked to the declining volumes on the main bourse. Enrique Marti, Director at interdin.com, a leading Spanish broker who covers around 25% of the domestic market feels that the decreasing volumes can be attributed to the growth of MTFs, he said in a comment to Forex Magnates: “last year the MTFs were having around 5% market share in Spanish equities, a number which has increased this year, 3 fold to 15%”. Spain was one of four European countries that suffered dramatically due to its debt crisis, the country’s budget deficit, is at 10.6% of GDP one of the highest in the EU. Like most countries suffering the brunt, the country has picked up 41 billion Euros in bail out packages. Spain’s unemployment figures are some of the worst in the region, nearly 27% of the country’s labour force is out of work. Correction: An earlier version of this article had stated the increase in MTF trading YoY was 25% when in fact it is 15%.